Family, resident at Boston, Mass. Born at Heinstadt, Germany, March 15, 1834; died Feb. 24, 1903. He went to America in 1848; resided in California from 1859 to 1869, when he removed to Boston, Mass. He married Lina Frank (Jan. 23, 1867). From the beginning of his residence in Boston he took an active interest in the affairs of the community. He was for over fifteen years president of the United Hebrew Benevolent Association and was one of its charter members; he was the first president of the Federation of Jewish Charities; treasurer of the Hebrew Industrial School, founded by his wife; and the first president of the Elysium Club. He was appointed trustee of the state hospital by the late Governor Ames, and was successively reappointed by Governors Russell, Wolcott, and Crane. He was the first chairman of the Boston branch of the Baron de Hirsch Society for the Amelioration of the Condition of Russian Refugees. Born at Heinstadt, Germany, June 27, 1827. He went to America in April, 1848, stayed for a short time in Baltimore, Md., went to San Francisco, Cal., in June, 1853, and to Boston in 1862. He was for many years a director of the United Hebrew Benevolent Association and of the Leopold Morse Home, a member of the advisory board of the City Institutions, and a director of the New York and New England Railroad Company. Wife of Jacob H. Hecht; born in Baltimore, Md., 1848. 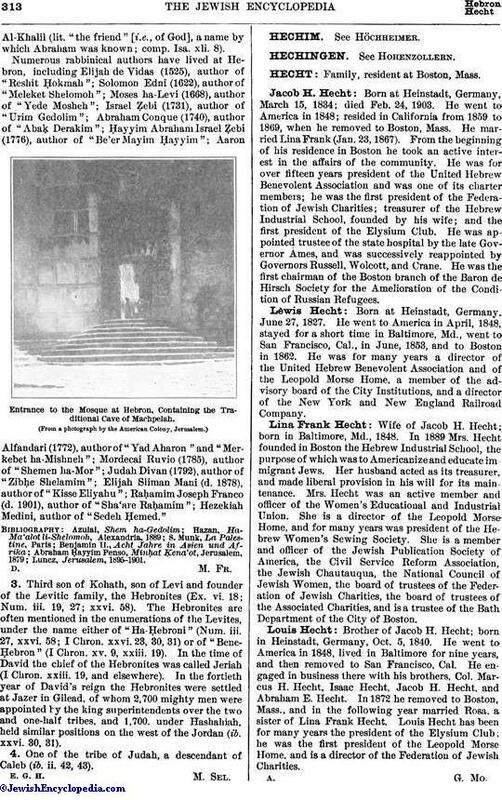 In 1889 Mrs. Hecht founded in Boston the Hebrew Industrial School, the purpose of which was to Americanize and educate immigrant Jews. Her husband acted as its treasurer, and made liberal provision in his will for its maintenance. Mrs. Hecht was an active member and officer of the Women's Educational and Industrial Union. She is a director of the Leopold Morse Home, and for many years was president of the Hebrew Women's Sewing Society. She is a member and officer of the Jewish Publication Society of America, the Civil Service Reform Association, the Jewish Chautauqua, the National Council of Jewish Women, the board of trustees of the Federation of Jewish Charities, the board of trustees of the Associated Charities, and is a trustee of the Bath Department of the City of Boston. Brother of Jacob H. Hecht; born in Heinstadt, Germany, Oct. 5, 1840. He went to America in 1848, lived in Baltimore for nine years, and then removed to San Francisco, Cal. He engaged in business there with his brothers, Col. Marcus H. Hecht, Isaac Hecht, Jacob H. Hecht, and Abraham E. Hecht. In 1872 he removed to Boston, Mass., and in the following year married Rosa, a sister of Lina Frank Hecht. Louis Hecht has been for many years the president of the Elysium Club; he was the first president of the Leopold Morse Home, and is a director of the Federation of Jewish Charities.